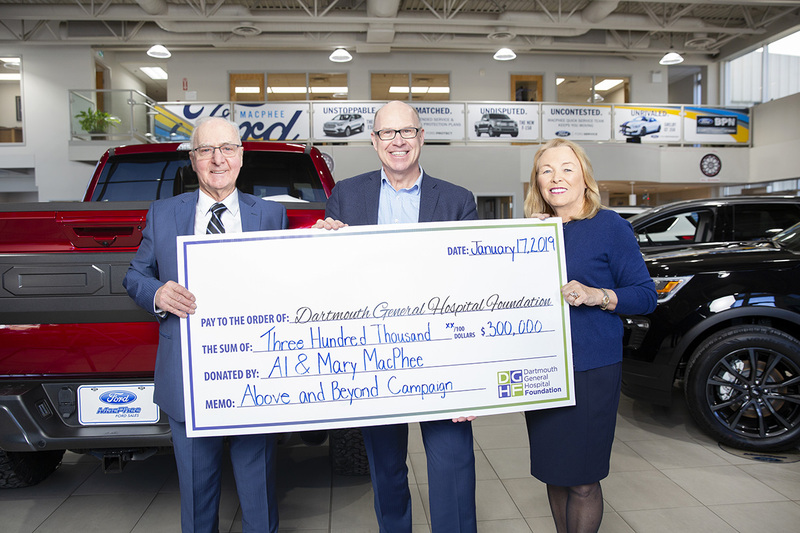 DARTMOUTH, NS (Feb. 21, 2019) - Generous support for the Dartmouth General Hospital Foundation’s $13M Above and Beyond Capital Campaign has come from many generous individuals, companies and organizations from all corners of this community, and everyday people have been the true difference makers of the campaign – everyday people like Al and Mary MacPhee. Al and Mary chose to support the Dartmouth General Hospital because of their close ties to the community of Dartmouth and their strong belief in the institution. The MacPhee’s have expressed particular pride when it comes to the Dartmouth General and have showed their support in many ways throughout the years as annual donors, event attendees and supporters, and through various volunteer roles. Al and Mary strongly believe the Redevelopment Project is an important initiative for the communities the hospital serves. They hope to inspire and encourage everyone who is considering making a donation to the Above and Beyond Capital Campaign to do so. The project will help fund the creation of a new Surgical Centre with 8 new operating rooms and an Ambulatory Care Centre with 18 new clinic rooms which will have the latest equipment and technology so that physicians and staff can deliver an even higher standard of care to the patients of Dartmouth and Halifax. The MacPhee’s are helping Dartmouth step up to change the way the Dartmouth General Hospital can deliver care by reducing wait times for hip and knee replacement surgeries in Nova Scotia. Their gift will also help increase the number of endoscopic screening procedures; increase capacity in inpatient, outpatient and diagnostic care; and improve patient flow, privacy and comfort. They believe our new facilities will attract the best physicians and nurses and encourage education programs, which will grow our community even further. Thank you Al and Mary MacPhee.